In the 1960s, the United States was divided along the fault line of color, created by racism. The South – the states that had left the Union to protect slavery and states’ rights during the Civil War – was still segregated. 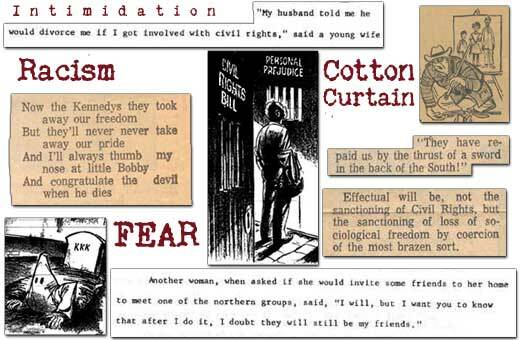 Fear was the staple crop that supported the cotton curtain of Jim Crow. But racism and segregation were not confined to the South. In Illinois, for example, blacks could vote and the rules of Jim Crow were more subtle. In the 1950s, as more than 300,000 southern blacks poured into Chicago, the city became entirely segregated along residential lines. The fight was not who could sit where on a bus, but where whites and blacks could live. With housing went schools. With schools went education and with education went jobs. Racism wore different faces, with different consequences, in the different regions of the country. This created regional divisions in the country as well.